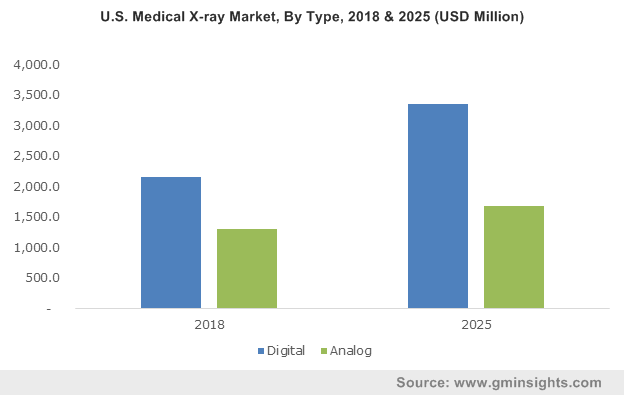 Medical X-ray Market size was valued at USD 11.2 billion in 2018 and is expected to witness 6.1% CAGR from 2019 to 2025. Growing burden of chronic disease such as cancer, cardiac diseases, neurological diseases, dental problems and musculoskeletal disorders should drive the medical x-ray market growth during the forecast period. Medical x-ray has led to advances in diagnosis and treatment of several medical conditions. Increasing patient preference towards x-rays for non-invasive and painless disease diagnosis will favour business growth. Moreover, favourable reimbursement scenario for x-ray diagnosis leading to surge in the number of people opting for x-ray will spur industry revenue over the analysis timeframe. Furthermore, digital solutions have revolutionized medical imaging by offering better image quality, faster processing time and dose reduction advantages over the conventional systems. Focus of industry players on offering high-tech and affordable systems will further accelerate industry growth. For instance, Multix Fusion, analog x-ray system developed by Siemens, offers ease of use, improved image quality, dose reduction, speed, efficiency as well as versatility. However, high installation costs along with risk of radiation exposure may hinder medical X-ray business growth to certain extent in the foreseeable future. Digital systems segment held more than 55% revenue share in 2018 and will show lucrative growth by 2025. Segment growth is attributed to advantages offered by digital systems including enhanced images, time efficiency and digital transfer of images. Furthermore, these digital x-rays provide real time imagery and allow accurate diagnosis that should foster segment growth over the coming years. Software segment held considerable revenue in 2018 and is anticipated to witness around 6.3% CAGR over the forecast period. Medical imaging software is an integral part of the x-ray machines that offer high quality images in shorter times. Development of advanced medical X-ray image analysis software in treatment and data management has increased its adoption over the recent years. Need for a consistent software solution for efficient diagnosis will drive segment growth during the analysis period. Direct radiography (DR) segment is poised to witness over 6.5% CAGR owing to its benefits over conventional technologies. Ability of DR technology to save and share images electronically without the use of film and chemicals has increased its adoption over the recent years. Moreover, features such as generation of quick images, improved workflow and decreased exam time will favor business growth. Portable systems segment was valued more than USD 4.5 billion in 2018. Segment growth is attributed to growing need for point of care diagnostics that has led to development of portable X-ray systems. Increasing geriatric population with mobility issues, rising awareness regarding portable devices, investment in R&D activities for developing advanced portable technologies will further enhance the segment growth. Orthopedic segment held more than 19% revenue share in 2018 and will witness similar trend during the forecast period. Osteoporosis prevalence is increasing among females owing to weaker bones and low bone density in comparison to males. As per the International Osteoporosis Foundation (IOF), around 5 million people aged 50 years and above had osteoporosis in 2015 and women accounted for 22.5%. Increasing prevalence of orthopaedic disorders will surge the demand for effective appropriate and effective diagnosis thus, will spur the segment size. Diagnostic centers segment held around 44% revenue share in 2018. X-ray being the most effective and conventional diagnostic tool and digitization in the x-ray has observed a strong position in diagnostic laboratories worldwide. The diagnostic centers provide treatment at significant less cost as compared to hospitals due to high operational efficiency. Moreover, risk of hospital acquired infections will increase patient preference towards diagnostic centers, thus, driving segmental growth. 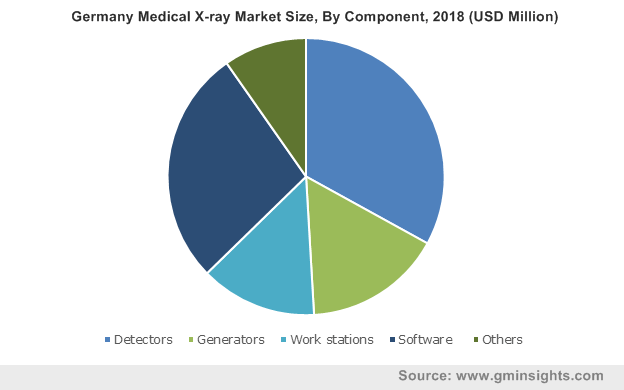 North America medical X-ray market held over 33% revenue share in 2018 owing to high demand for preventive care and early disease diagnosis. Technological advancement in X-ray systems coupled with rising incidence of gynecological and orthopedic disorders will surge its adoption in the region. Strong foothold of major industry players in North America focusing on various strategies including innovative product launch will positively impact industry expansion. 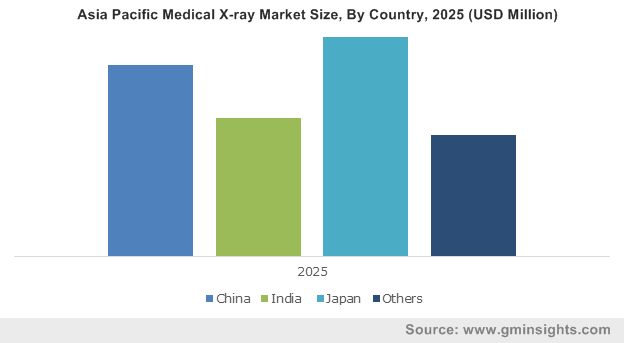 Asia Pacific medical X-ray market will witness lucrative CAGR of more than 7.5% over the forecast period. 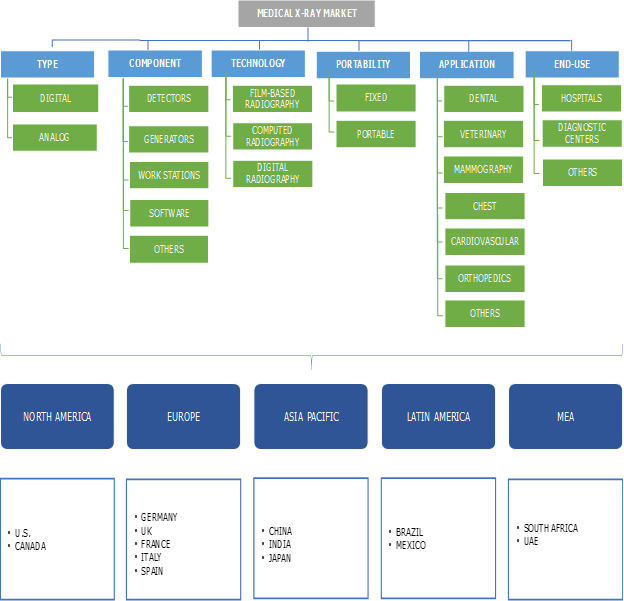 Presence of large patient pool in densely populated nations such as India and China, susceptible to several chronic diseases will act as primary driver in the regional business growth. Furthermore, government support coupled with growing awareness pertaining to disease detection and treatment will increase regional business growth over the coming years. Some of the key industry players operating in the medical X-ray industry include Carestream Health, Shimadzu, Dentsply Sirona, Fujifilm Medical Systems, Canon, GE Healthcare, Hitachi Medical, Midmark, Konica Minolta, PerkinElmer, Hologic, Varian Medical Systems, Siemens and Philips Healthcare. Industry players are focusing their efforts on developing technologically advanced medical X-ray to enable precise and cost-effective systems to cater increasing consumer demand in developed as well as developing countries. For instance, in February 2019, Philips developed DigitalDiagnost C90, industry’s first digital radiography system with live camera image at the tube head. This new product launch helped company to strengthen its existing product portfolio and broaden its customer base. History of X-ray industry can be traced back in the late 1890s with the discovery of X-rays by Wilhelm Conrad Roentgen. There have been numerous twist and turns along the way, as medical imaging technologies evolved over the period. Medical X-rays have now become an important diagnostic tool for disease detection as well as preventive care. With the advent of technology, there has been a considerable shift in imaging technology, from using conventional film-based to digital technology that does not require films, chemical or dark rooms. Digital sharing and saving of images enable efficient diagnosis and ensure timely treatment. Awareness regarding early disease detection and treatment along with focus of industry players on development of innovative products will augment the medical X-ray industry growth during the forecast timeframe.